Siemens Gamesa Renewable Energy (SGRE) has officially inaugurated its first rotor blade factory in the Middle East and Africa (MEA) region at Tangier (Morocco). 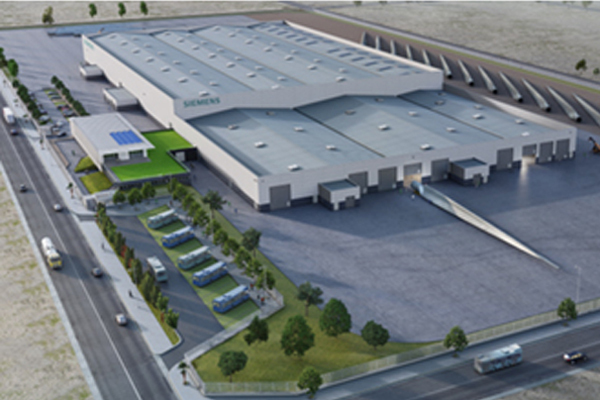 The 37,500-sq-m facility is strategically located in the industrial zone of Tanger Automotive City, approximately 35 km from Tanger-Med port. Ideally positioned between Europe and Africa, it provides the company with direct access to some of the most important markets. The plant is now ready to offer wind turbine blades ‘100 per cent made in Morocco’, said a senior company officials at the opening ceremony which was attended by Morocco’s Minister of Industry, Investment, Trade and Digital Economy Moulay Hafid El Alamy and Siemens Gamesa CEO Markus Tacke. To equip the SWT-DD-130 platform turbines (up to 4.2MW power rating), B63-10 blades with a length of 63 m are produced for export to Europe, Africa and the Middle East, as well as for local projects, they added. Speaking at the launch, Tacke said the plant is ready to produce other blade models in the future, which could reach up to 75 m. These integral blades are based on licensed technologies and made of composite materials, he noted. “This factory is good for our company and a solid business decision. We invest where we see strong business opportunities, and the opportunities here in Morocco are stronger than ever before. This location in Tangier provides us with direct access to some of the most important markets of tomorrow – here in Morocco, throughout the Middle East, in Europe, and in the Mediterranean region,” he added. Underlining the importance of the project, El Alamy said: "The first wind turbine blades in Africa and the Middle East will be produced in Tangier and it represents a pride for the kingdom." "This pioneer project allows localizing value and announces the development of an ecosystem "renewable energy industry" which reinforces the strategic choices of Morocco, under the leadership of King Mohammed VI, aimed at the development of a green economy," he noted. A 3,500-sq-m training centre has been created to facilitate the knowledge transfer from Denmark to Tangier, he added. TMSA (Tanger Med Special Agency) responsible for the planning, the development and the management of the Tanger Med Port complex and industrial platform, has shown great support and insight in the achievement of this project. Ricardo Chocarro, Onshore Business CEO of Siemens Gamesa, said: "In Morocco, the demand for electricity increased at an average annual rate of 6.7 per cent from 2003 to 2013. Thus, renewable energy is particularly attractive, offering a secure supply of domestically-produced power and contributing to energy independence." "Our commitment to the government and people of Morocco is clear: we will work together with you in meeting your energy challenges, today and in the future," he added. The new blade factory plays an important role in contributing to the Morocco’s national program to achieve production of electricity from clean energy to up to 52 per cent by 2030, of which 20 per cent is generated by wind. The 850MW project that will be built by the consortium Siemens Gamesa, Nareva and ENEL represents a major milestone in this goal. With 72 per cent market share in Morocco, Siemens Gamesa delivered key wind energy projects including Tarfaya (300MW), Tangiers (140MW), Essaouira (60MW) and Haouma (50MW).